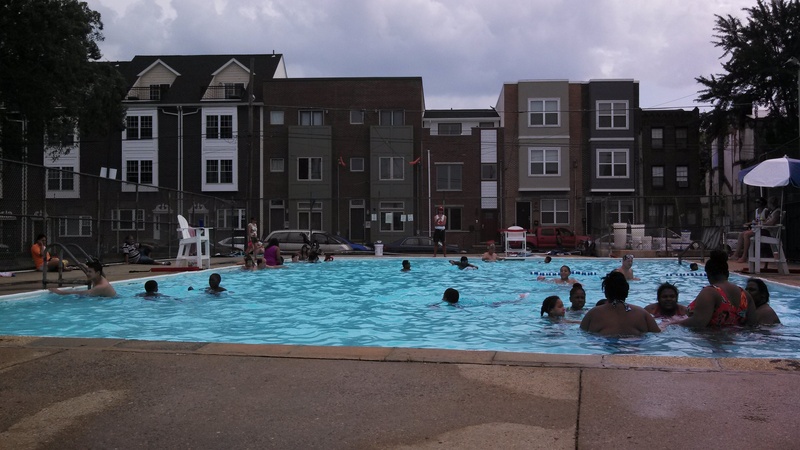 The mini melting pot that is Sacks Pool encapsulates South Philly’s diversity – racially, linguistically, aesthetically – and has the energy to match. The surrounding fence hugs the pool close. And despite Solomon Sacks Playground’s 3.7 acres and Jefferson Square Park across the street, there’s no mistaking that you’re anywhere but the heart of the city. Sacks Pool was built in 1971, a few years after the recreation complex of which it’s part. Sacks’ well-worn soccer field and baseball diamond now also host the culminating event of the largest Cinco de Mayo festival in the United States, the San Mateo Carnavalero or Carnaval de Puebla. Back in 1778, the site hosted a different sort of festival, a giant farewell party (known as the Mischianza) for British General Sir William Howe, Commander-in-Chief of the British forces during the early years of the Revolutionary War. In the intervening years, from around 1836 to 1945, the spot was home to the Southwark Foundry and Machine Company, manufacturing engines, boilers and other machinery. In 1994, Bruce Springsteen filmed part of his video for “Streets of Philadelphia” at Sacks (you can almost make out the pool deck around minute 1:45) and afterwards donated $45,000 to its upkeep. Successful community efforts to maintain and improve the underfunded facilities made the Inquirer in both 1990 and 2004, and in 2005 Home Depot and the National Council of La Raza paid to refurbish them. Closed for the season during the 2009 budget cuts, Sacks also hosted Mayor Nutter’s 2010 press conference to announce all the pools would re-open that summer. Sacks’ facilities take up the block between Washington and Federal and 5th and 4th Streets; the pool is on the Federal Street side, closer to 4th.